Last Thursday the biggest and firstest Jewish film festival in the world started up for the 32nd time. 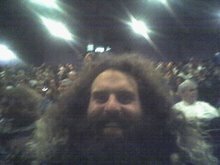 I call it Jewfest North because it's actually one of three Jewish film festivals in the SF Bay Area. There's also the Silicon Valley Jewish Film Festival, aka Jewfest South, which I attend regularly, and the East Bay Jewish Film Festival, aka Jewfest East, which tends to conflict with Cinequest or SFIAFF so I've never been (but I'm sure they have a great program, too.) Anyway, as I said Jewfest North is the first and biggest, so if any one deserves the "Jewfest" moniker without any modifier, it's this one (sorry, Jewfest South! I'm still a fan!) But, on the other hand, I like including the moniker, so I'll continue to call it Jewfest North. Anyway, we started with some opening remarks from Program Director Jay Rosenblatt and the new Executive Director Lexi Leban. The remarks were pretty standard, maybe even a little short for opening night, but they made kind of a running gag about how they're just going to say a little more and then the movie will start. When the film's director Roberta Grossman got up briefly she mentioned she just wanted to thank all the hundreds of individual backers of the film, and that got a good laugh. Of course, Jewfest North also has probably the most opinionated and politically involved audience, so when they thanked presenting sponsor Wells Fargo (who is a long time sponsor of many, many film festivals) it got a mix of applause and hisses from an Occupy-friendly crowd. Somehow, it just made me feel like the festival is really starting. And the festival started with a delightful little documentary, HAVA NAGILA, the story of the most Jewish of all Jewish songs. It takes a playful look back on the origins of the song as a way for Jews of today (and especially American Jews) to connect with their own origins. It goes back to the town in the Ukraine where it all started as a wordless prayer (a Hasidic tradition was to pray with a song, because words were insufficient for communicating with G-d.) Originally it was conveyed more of a sense of longing than the pure joy it conveys today, and actually my favorite rendition in the film was near the end when a rabbi demonstrated that original version. In the early days of Israel, the tune was adapted, made more cheerful, words were added (the quickie translation: Rejoice! [repeat until everyone is done dancing the hora]) and it became an unofficial anthem of Israel. American Jews, who had been assimilating very well, suddenly wanted a connection to this Jewish nation, and the Hava became that connection. But it also grew into a world music hit, outside of the Jewish population. And more than anyone that was the work of Harry Belafonte, who loved to sing it. Belafonte is interviewed in the movie along with plenty of other celebrities, both Jewish (Leonard Nimoy, who admits that the Vulcan V hand gesture came from his memory of rabbis holding their hands like that during a certain prayer) and not (Connie Francis, who had one of the most successful records of Jewish music despite only being, "10% Jewish on [her] manager's side.") The movie even follows it to the eventual parodies, when American Jewry was ready to lampoon itself with the likes of Mel Brooks or Allan Sherman (who made his parody "Harvey and Sheila") And it continues to the eventual Hava haters, who I see as the hipsters of the Jewish music scene who complain that people only know Hava Nagila and have ignored the rest of Jewish musical tradition. In short, instead of the Hava being a gateway to Jewish music, it's been a cul-de-sac--leading nowhere. Personally, while I understand complaining is kind of the Jewish sport, that's far too much thought about a song that's really just about having fun. Well, then it was time for the party at the Swedish American hall. A bit of nosh, some drinks, and a sinful amount of dessert. But my favorite thing was the pair of "Jewvision" glasses. They look like the cheap paper 3-D glasses, but they actually have diffraction gratings in a pattern to make any point source of light have a rainbow Star of David around them. Super awesome!